You guys. I don’t know if you’ve noticed but the picture quality lately has been kinda eh. Truth is, my camera decided to start acting up (which I don’t blame it for…I’ve been pretty brutal in my handling and tossed it around a lot). Plus the lens was all scratched up and, yeah, I’ve basically been shopping for a new one. Until then, you might have to deal with some sad backup pics that I take with my phone. But I figured I should keep on keeping on with the posts. And so we come to Paprika in the East Village. It’s a restaurant right across one of my favorite brunch spots, Cafe Mogador. I was meeting up with my friend Laila, and it was the first time either of us have been. Well, actually I think I vaguely remember stopping in here for dessert years ago but not significant enough to really have an opinion about the place. It definitely has a cute, rustic ambiance — dimly lit with lots of tables waiting to be occupied by mostly couples. We were greeted by a jumpy waiter who told us about the mushroom-centric prix-fixe menu options which I think included something with polenta and a main course that included veal juice, so I decided to pass. 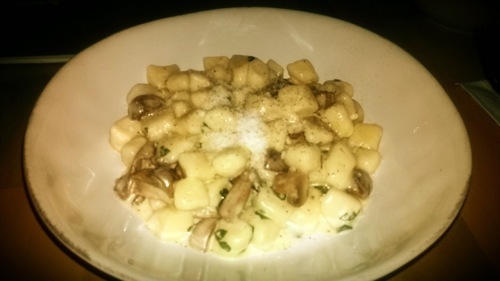 Instead, I opted for hand-rolled potato gnocchi with roasted mushroom and light cream sauce. 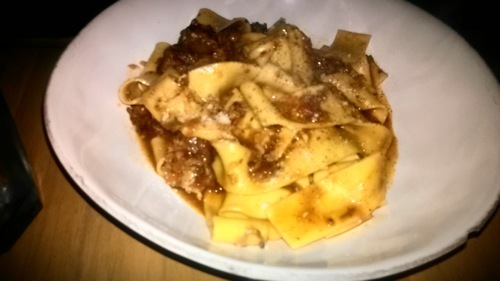 Laila got the handmade pappardelle with braised oxtail ragu. The dishes came out FAST. I felt like my gnocchi was a little on the bland side (even with the added parmesan and pepper from our waiter), and I only got through half. Laila was also a bit underwhelmed with her pappardelle, saying it wasn’t bad, but just nothing really special. 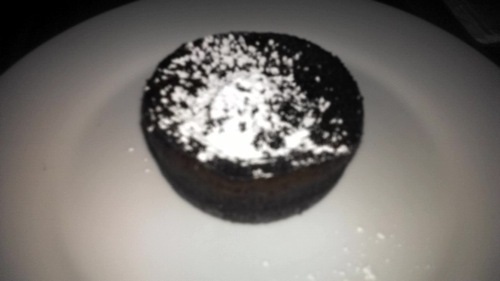 We were hoping dessert would make up for it: Chocolate Soufflé. The souffle was a welcomed burst of warm, melted chocolate, and maybe it was a good way to finish the meal off. But overall, probably not my favorite of restaurants. At least the conversations were flowing, and for once, the food wasn’t the main focus — thanks, Laila! Would I go back? : Probably not. Their brunch is delicious as well! Must try that souffle. Hmm! Absolutely great post! The foods are really amazing and mouth watering! This place is perfect for a family get together.